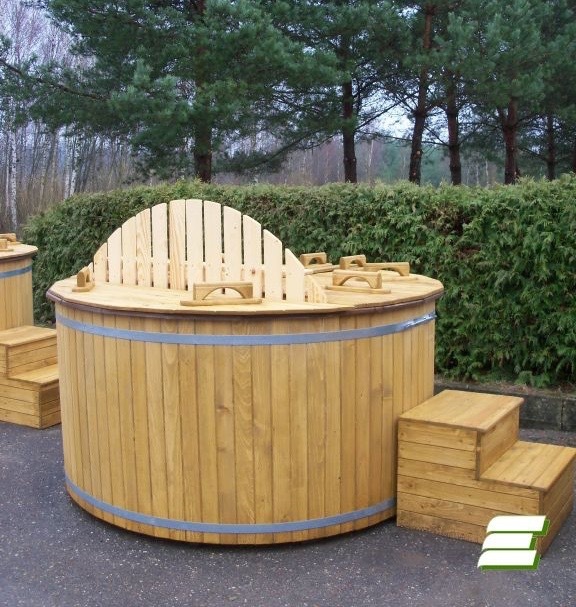 A wooden hot tub is a barrel designed for bathing, made of high quality wood with an installed wood-burning furnace. 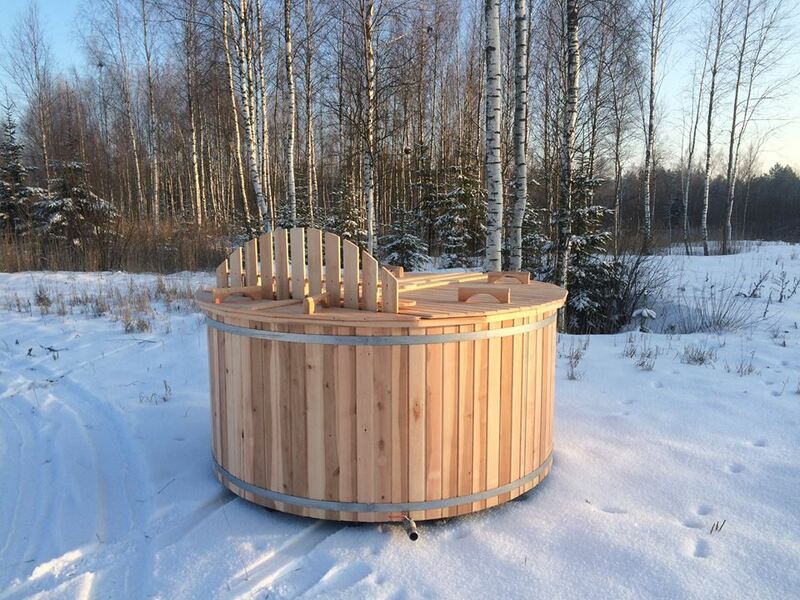 After a couple of hours of heating one can enjoy bathing in hot water – in the open air, in a garden or on a terrace. 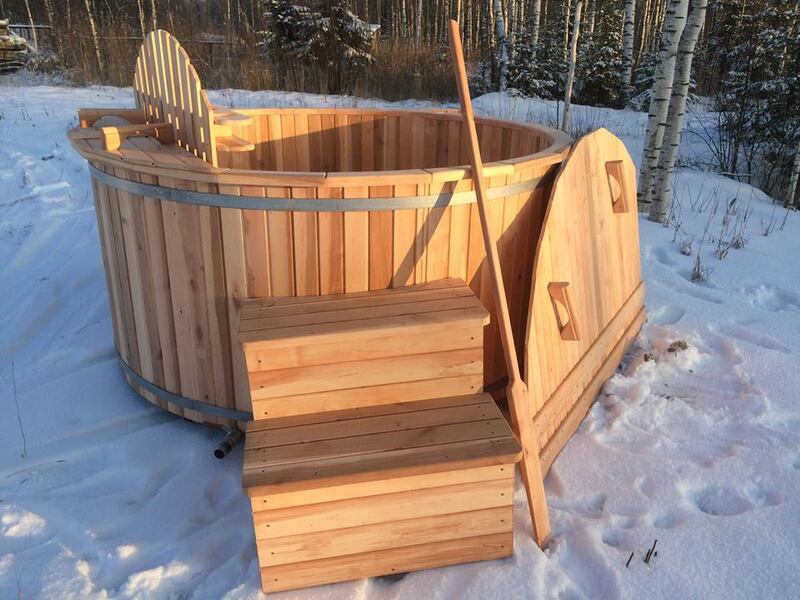 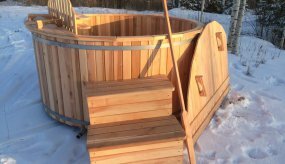 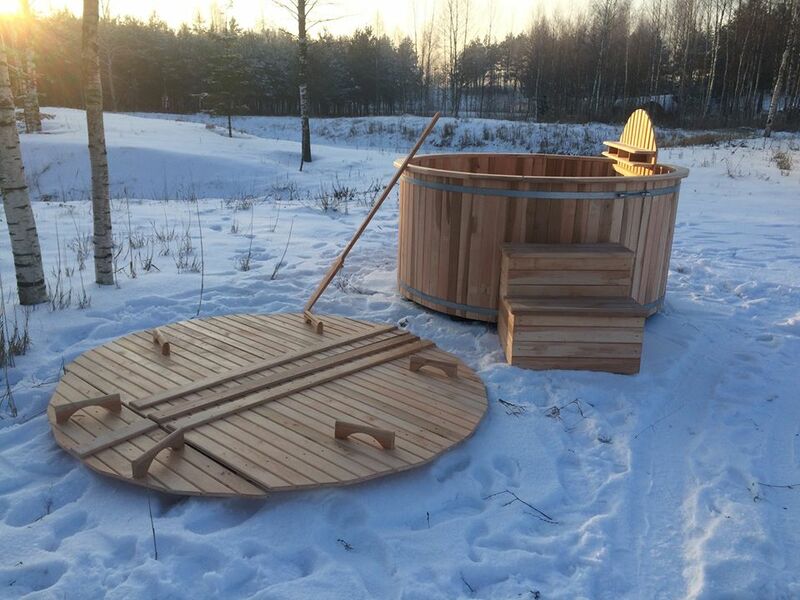 Wooden hot tub is designed to be used during any season. 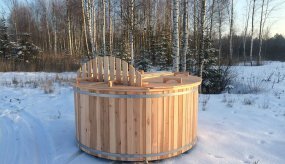 It feels good to submerge into cool water under the hot sun in summer, while in winter it is a real pleasure to enjoy hot water. 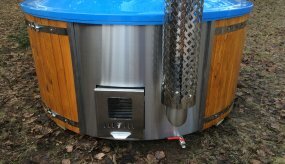 Water in the barrel circulates under the impact of gravity and depending on the weather and the size of the barrel it takes around 2-4 hours to heat the water to 40-50 degrees. 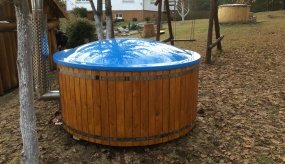 Wood remains a “live” material- the Hot Tub dries out when standing empty for a longer time period. 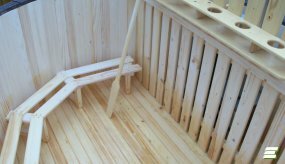 A Hot Tub has to be treated 1-2 times a year from its outside with wood maintenance products (oil, wood glaze, wax). 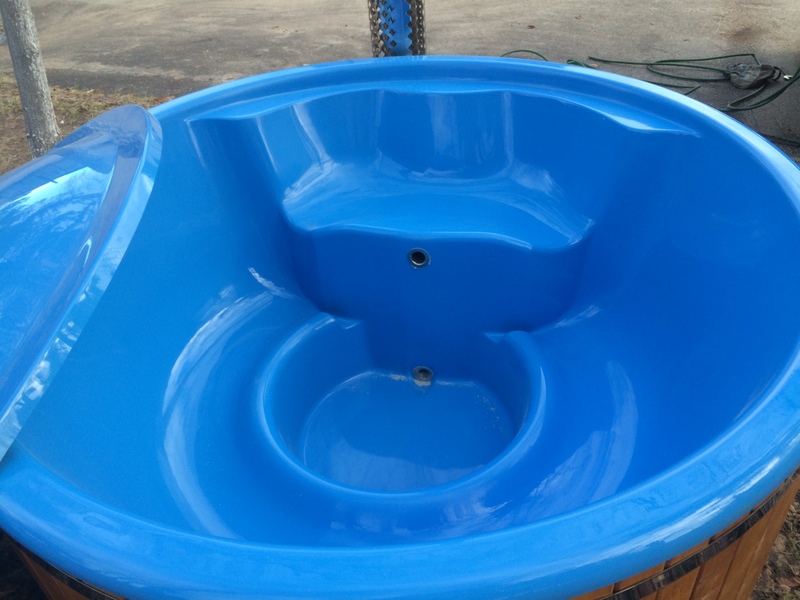 The Hot Tub can be cleaned by means of a brush or a high-pressure cleaner. 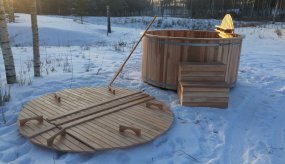 How does a Hot Tub function? 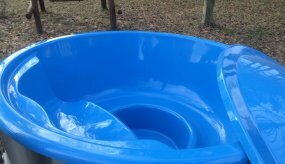 The best way is to use a garden hosepipe in order to fill the tub with water up to 4/5 scale. 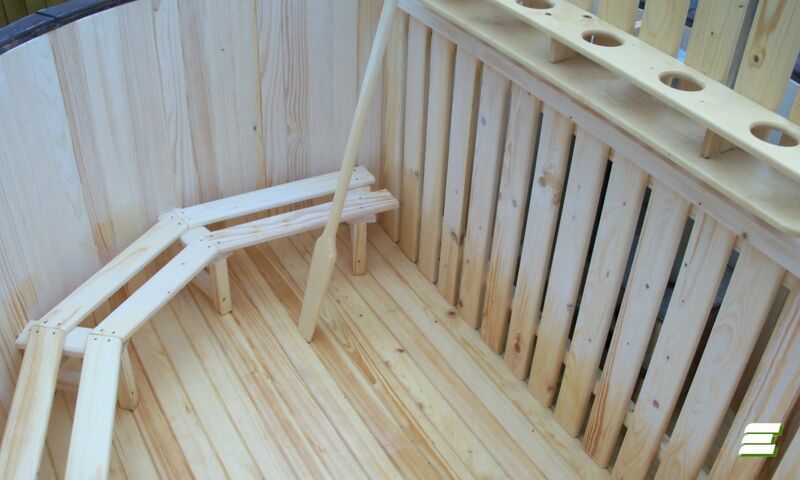 Over the stove surface has to be at least 3 cm water when the heater is installed in the inner of the tub. 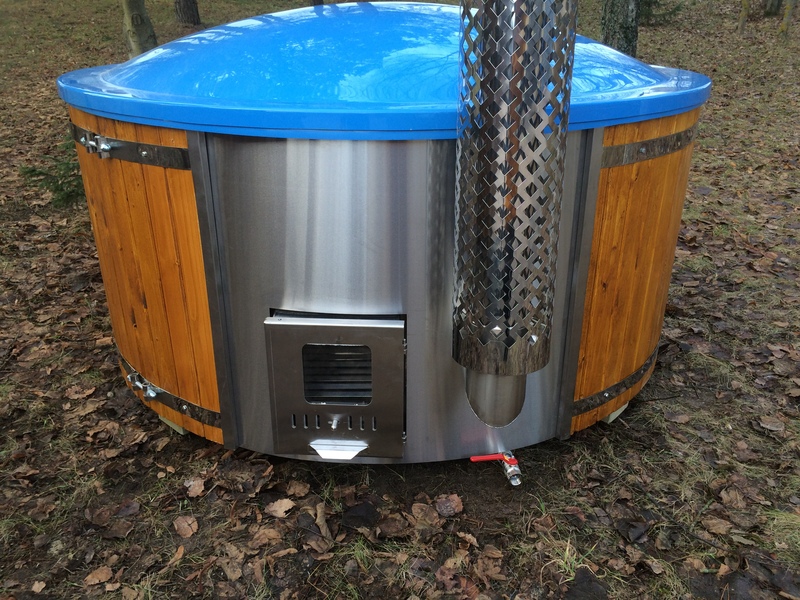 Never heat the Hot Tub when empty. 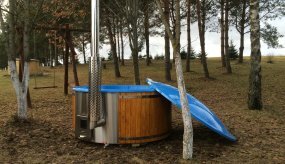 It is only allowed to empty a Hot Tub until the stove has cooled down completely. 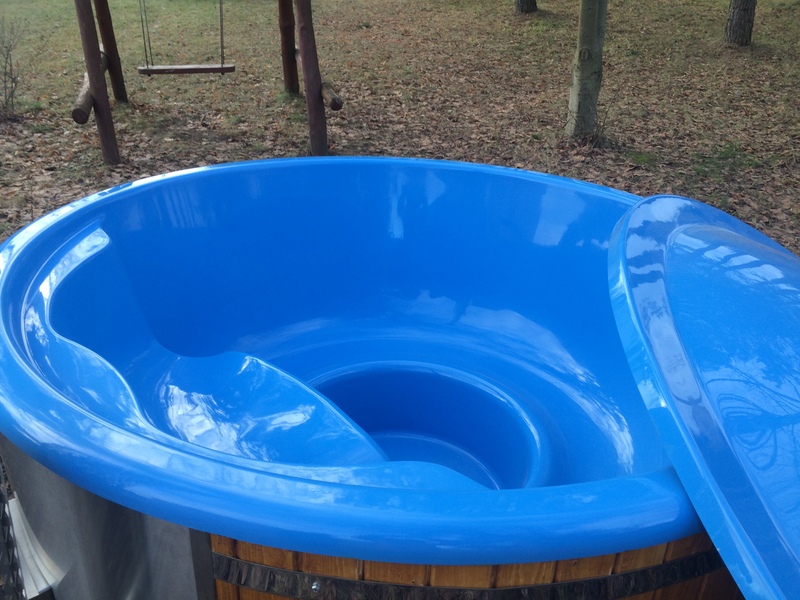 The Hot Tub does not need to be emptied every day, only if necessary. 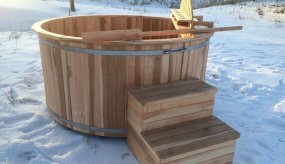 The water can overstay in the Hot Tub during the winter but it should not freeze up completely. 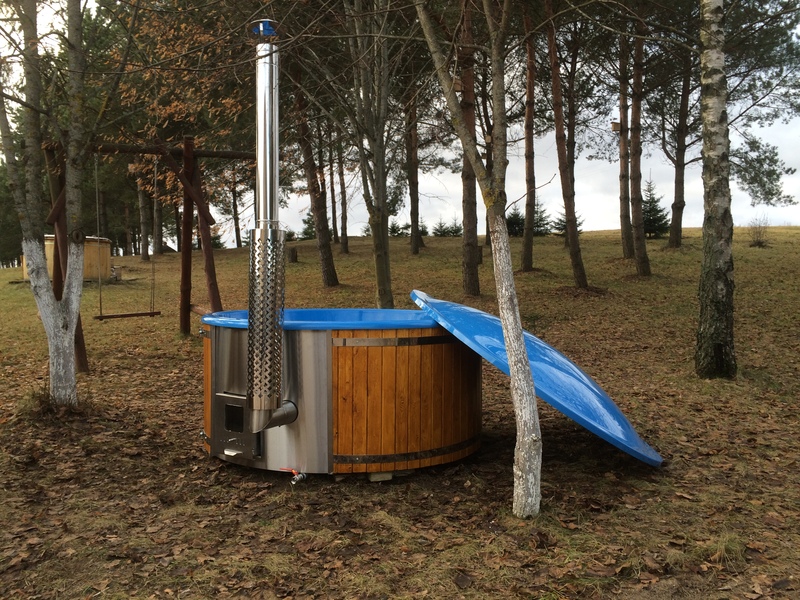 We recommend that the oven only to be heated when the water completely flooded the oven. 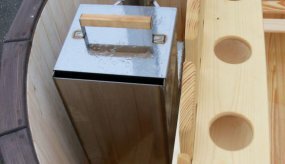 If the oven is not cooled, the water should not be let out. 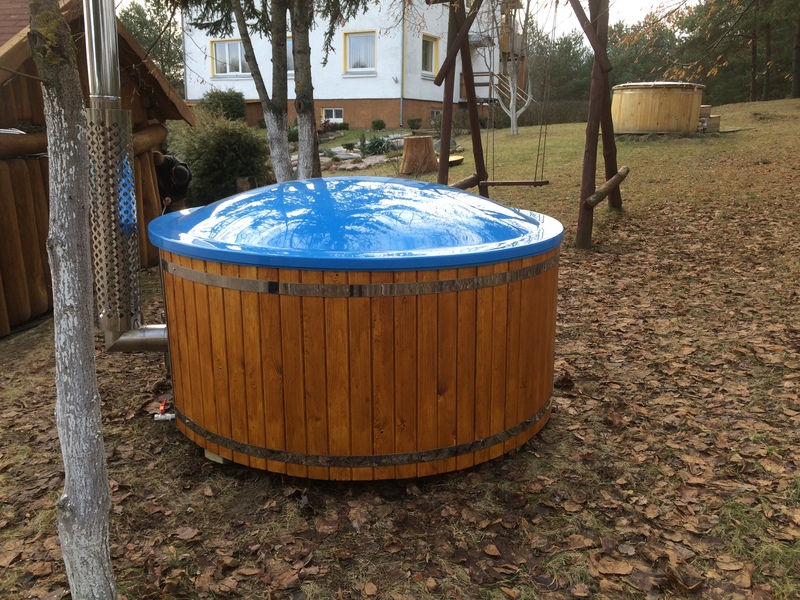 During the summer season the hot tub must be filled with water to not dry out. 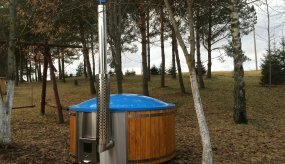 In winter to keep water is not neccesary, because the air temperature is still quite moist. 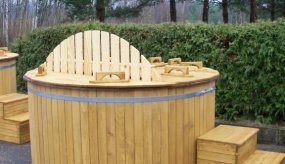 The cleaning care is quite simple, a hot tub should be cleaned with a high pressure water stream. 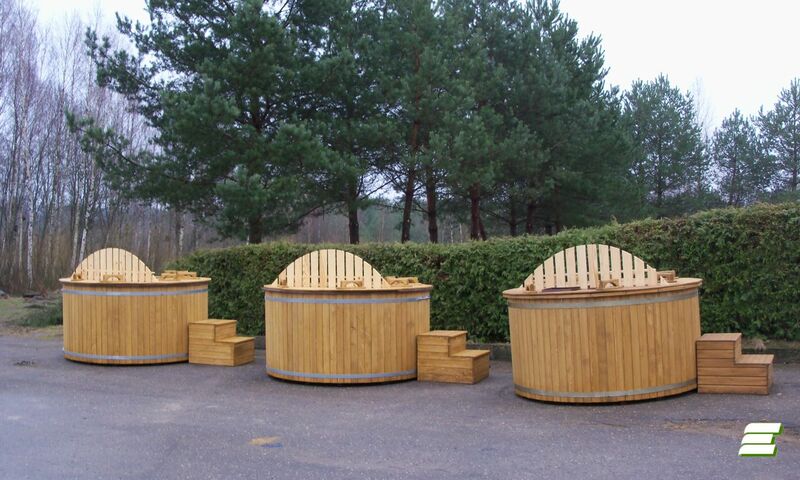 On request, we can also manufacture Hot Tubs with different dimensions, shapes and types of wood. 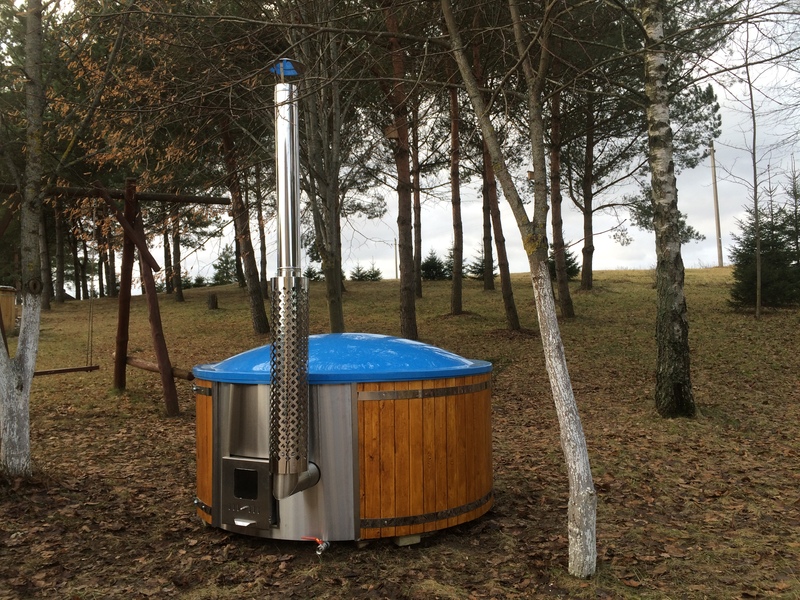 A stainless steel “Elmaga″ stove with a chimney of 2 or 2,5 meters. 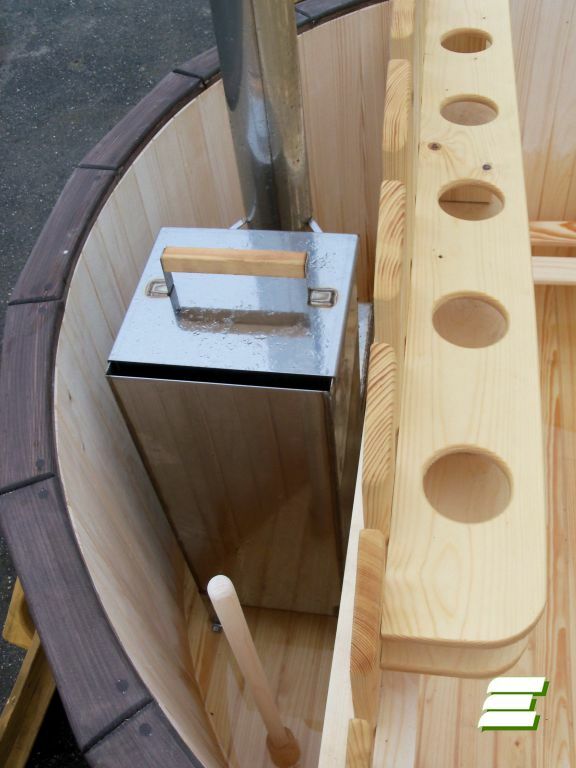 The stove could chosen between internal or external. The wood-fired hot tub is supplied fully assembled and ready to use immediately. 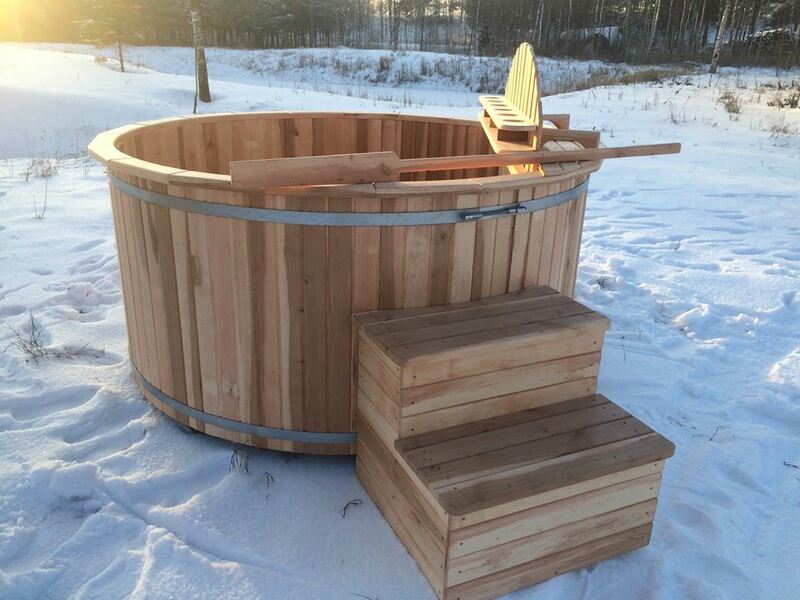 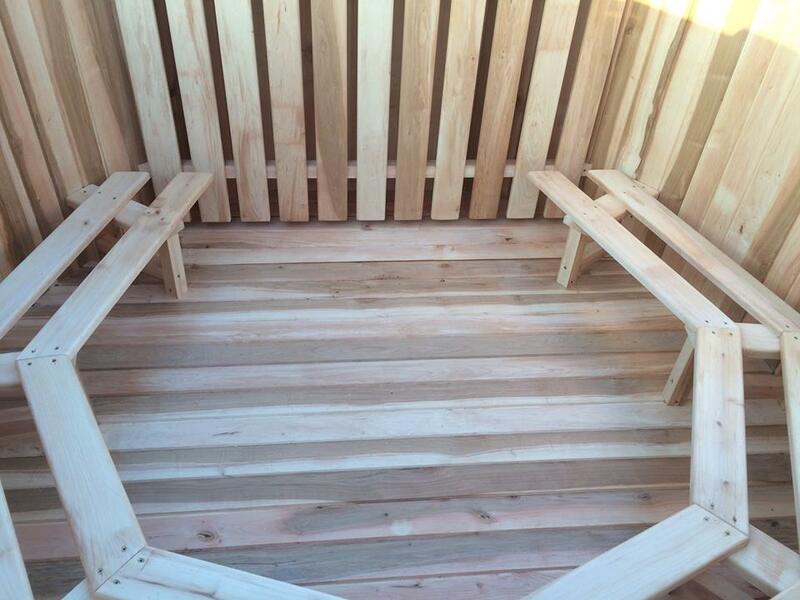 The hot tube is made of coniferous wood, but under special request could be also made of other wood. 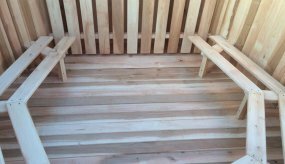 The inside of the wood is impregnated with special spa oil. 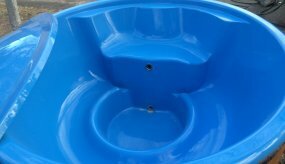 Upon request we also manufacture Hot Tubs with plastic inner.